Used Mazda 5 Review - 2005-2011 | What Car? 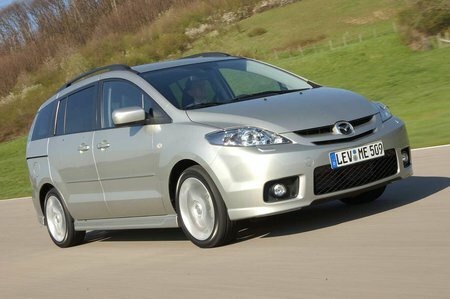 What's the used Mazda 5 MPV like? The 5 seats seven. The middle row of seats consists of two large outer seats that move back- and forwards independently, plus a smaller middle seat. The base of this middle seat folds away and the back forms an armrest, or moves out of the way to allow passengers into the two rear seats, which fold flat into the floor to create more luggage space. That's all very clever, but the real star of the show are the sliding rear doors, which are a real help in tight parking spaces. Some of the cabin's plastics feel a little flimsy, but for the most part the dash looks upmarket and clearly laid out. The driving position is good, too, and there's a loads of oddment stowage in the well thought-out cabin. On the road the 5 has a slightly sporting feel. It certainly handles well enough, but the price is a firm ride and a slight lack of refinement.